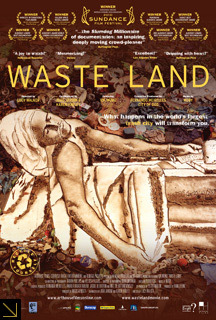 Waste Land is a documentary by Lucy Walker, João Jardim and Karen Harley about the efforts of the Brazilian artist, Vik Muniz, to collaborate with trash pickers in Brazil. Muniz is known for making artworks using unusual materials (wire, chocolate, earthworks, etc.) and then photographing them. He went to one of the world’s largest landfills, Jardim Gramacho, outside of Rio de Janeiro. There he sought out people who make their living by picking out recyclable materials from the garbage and selling them. He made giant portraits of some of them out of trash, which he then photographed. The film introduces us to several pickers, and we learn about their lives. Not surprisingly, they express mixed feelings about what they do. They defend the way they make a living, and they say it is better than becoming criminals or prostitutes, yet they would clearly rather be doing something else. Some of them were once middle class but have fallen on hard times. Muniz, who comes from a lower middle class family, reflects that with different luck he could have ended up as picker himself. One particularly engaging person is an old man who gives philosophical advice to the other pickers. One gets a sense of a feeling of community among the pickers, who often look out for one another. We meet a young man named Tias who is trying to organize the pickers. What is most remarkable about this film is that it conveys a sense that there is dignity in the way these people make a living. The film ends on an upbeat note. Muniz donates the money he makes from selling his photographs to the group Tias has organized. Among other things, they use the money to create an educational center. 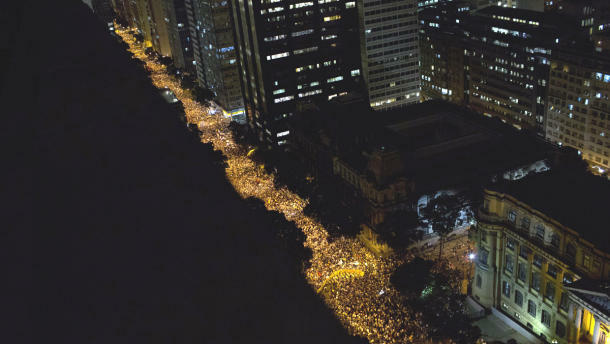 There is even talk of Tias running for President of Brazil some day. I have to admit, I found this film deeply moving (despite the guy sitting behind me who kept laughing at inappropriate moments). With so much bad news, it’s nice to see a documentary that ends on a hopeful note. I especially like that the film suggests that there are ways that art can be used to better the world.